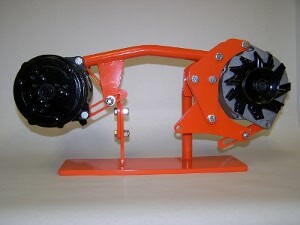 This new accessory drive system for the 230, 250, and 292 cu.in. Chevrolet six cylinder engines features a combined A/C and alternator upper mount and a stand alone lower power steering pump mount. Our unique cross bar mounting system provides reinforcement for both upper mounts resulting in a stronger, more compact mount. 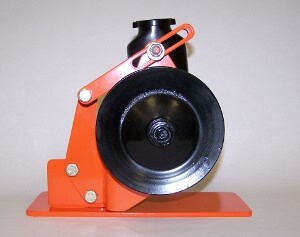 Each accessory has its own drive belt using a combination of stock 2 groove balancers and water pump pulleys. 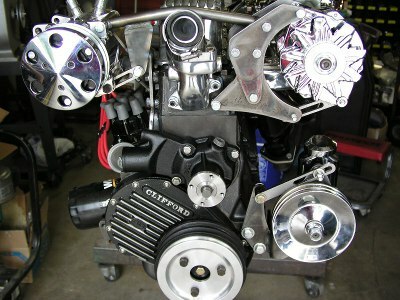 The stand alone power steering pump requires a stock GM pulley that bolts to the balancer face (user supplied). This is an extremely rigid mounting system that bolts to existing attachment points with no machining or modifications required. NOTE: SPECIFY ENGINE DISPLACEMENT WHEN ORDERING ANY OF THE ABOVE ITEMS.